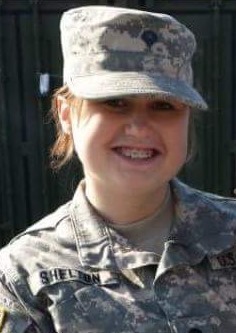 Ashley N. Shelton, 27, of Lafayette, Ind., died March 30, 2019. She was born December 22, 1991 in Frankfort, Ind., to Timothy Shelton and Connie (Remaly) Robbins. Ashley was a 2010 graduate of Frankfort High School. She was a U.S. Army E4, worked as an 88M motor transport operator and was a door gunner. She served from June 30, 2010 until April 14, 2018, and served in Afghanistan as part of her 3-year duty overseas. Ashley was a loving and dedicated mother to Ben and loved doing crafts and assisting him to succeed. Visitation will be 2-4 p.m. Friday, April 5, 2019 at Goodwin Funeral Home, 200 S. Main St., Frankfort. Funeral service with Military Honors will be 4 p.m. Friday at the funeral home. son: Ben Shelton of Frankfort, mother: Connie Robbins of Frankfort, father: Timothy Shelton of Lafayette, sister: Madison (Jose) Balero of Frankfort, niece: Adalynn Balero and nephew: Samuel Balero, aunts, uncles and cousins also survive. In addition to grandparents, she was preceded in death by an uncle, Dan Remaly, and 2 aunts, Lisa Remaly and Patty Skinner. I am so sorry for your loss Connie & Madison. I have such fond memories of Ashley at the Y she was such a sweet girl and awesome mom. We have gained an angel to watch over us. I am honored and blessed to have known you. You were truly a blessing, your gentle soul will forever remain in our hearts and soul through the eyes of Ben. May God give you eternal rest and us the strength to bear the great pain. Connie, Ron and I are so sorry to hear of the death of Ashley. We cannot begin to understand the pain your going through and we are here for you and your family. We love you, if there is anything let me know. Connie and Madison I am so sorry for your loss. There is no words to ease your pain and headache. I will be praying for your family that God will comfort you in your time of grief. My condolences to the family. Myself along with mom and dad are sending our deepest sympathy to you. Let us know if you need anything. I was sorry to learn of your daughter’s passing. Words don’t say nearly enough in times like this but know that I am thinking of you; blessings on you right now as you do one of the most difficult things you will ever have to do and I wish you peace in the coming days as you must adjust to the change taking place in your life. So sad of this loss of life too soon. Praying for peace for your family & hoping for a great future for your son. Had hoped that you & Moeka could meet again with your boys together this time. So sorry to hear about your loss. My heart goes out to you along with my prayers. I’m so sorry to hear of your loss! I will keep you and your family in my thoughts and prayers! So sorry to hear of your loss Connie. We will be praying for you and your family. I am so sorry to hear of the passing of Ashley. She was my sweet little first grader. I loved her smile and little giggle. I pray for peace for you, Connie, and your family. Connie & Ben, so sorry to hear of Ashley’s passing. Praying for you both! So very sorry to hear about Ashley’s death. Thinking and praying for you both during this very difficult time. My deepest condolences to each of you. I cannot imagine such a loss. Please know that you are in my thoughts and prayers. I am so sorry for your loss. There are no words to express my sorrow for you and your whole family. Hold tight to young Ben and look for Ashley in him. She will be there. Don’t hesitate to contact me if you need anything even just to talk. Connie I am so very very sorry to hear about Ashley. I am sending you thoughts and hugs. I pray for peace for you, Ben, Madison and your entire family. Love you dear friend. So sorry for this young lady’s death, may God speed your grieving and may God be with her son Ben. God bless you all. She didn’t know me, I just saw her story and am praying for the family. I am so sorry to hear about the loss of your daughter. I cannot imagine what you are going through and I pray for your peace in the coming days. You and your family are in my thoughts and prayers. Connie and Madison, I was so sorry to read of Ashley’s death. I remember Ashley throughout her years at Kyger. What a sweet little girl she was. I so admired her decision to join the military. I know that you will keep her memory alive for Ben. I am so sorry for your loss. Connie, words cannot express how my heart is bleeding for you and the entire family. You and Ashley were a huge part of my introduction to military life and for that I will always be thankful. Please know I am praying for your peace and comfort during this nightmare no mother should endure. Love always! My heart goes out to the family and friends of this amazing woman. I am so grateful for her service and the sacrifice she and her family have made so that my family can live safely every day. RIP Ashley Shelton and may God give comfort to those who love you! Sending loving thoughts and prayers. How heartbreaking to lose a loved one at such a young age. Please accept my condolences. Connie, I am so sorry to hear about the passing of Ashley. You and your family are in my thoughts and prayers. Ashley was not only my neighbor for my entire childhood and most of my teen years, but I considered her a great friend. Any questions I had she would answer and was always there if I needed her. I have so many memories with her and I will miss the opportunity to make new memories in the future! I love you Ashley! Rest easy sweetheart. You’re a great girl! Rest in peace fellow soldier you are in Gods army now. May God wrap his arms around your family and bring them peace and comfort. Till we meet again my sister in arms. Connie and Madison you have our deepest condolences. Our thoughts and prayers are with the whole family. My condolences to the family of Ashley. Although I didn’t have the privilege to know her personally she is a fellow Veteran which makes her family. As long as we continue to speak her name she will never be gone. Rest In Peace Ashley we got the watch sister. My thoughts and prayers are with you all as you grieve for your daughter, mom, friend and fellow soldier. Condolences to family and friends of this brave and courageous Veteran. Praying that your fond memories will sustain everyone through the mourning period. Rest In Peace, Angel. No one knows what you had been through nor what you were going through. I hope you have found some peace. To the Family, may God watch over and keep you. May you find strength and healing. God bless.